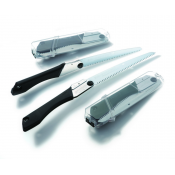 Silky saws are manufactured in Ono Japan, home of the finest cutlery steel known to man. 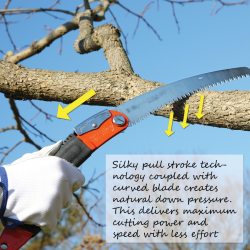 Crafting fine wood cutting saws since the early 1900’s, Silky continues to raise the bar for quality, endurance and cutting efficiency that none can match. Leading the industry in both design and innovation, saw users are changing their language in all parts of the world from merely asking for a saw, to asking for a Silky. Silky has gathered almost 100 years of experience in the production of handsaws, always with the greatest devotion and according to the latest techniques. The special alloys used, the metalworking knowledge and the technical aspects of the different type of teeth configurations stand for a unique quality. 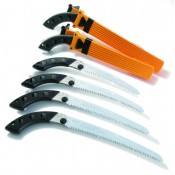 The saw blades of Silky saws are made from high-grade SK-4 carbon steel and cut out by laser. The blades are of unparalleled quality: they are very hard and longwearing, but remain flexible at the same time thanks to the metal’s soft core. The chemical composition of the metal in combination with the unique heating and cooling process determine the high hardness of the metal. 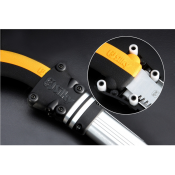 The high carbon content leads to a high wear resistance, so that the sharpness remains for a very long time. By forging the saws in such a way, the core of the saw tooth consists of soft metal with which the saw stays flexible and grabs the wood with ease. 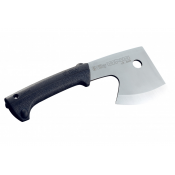 Furthermore, several models, such as the Sugoi, Hayate and the Tsurugi, are made of high-alloyed steel, which makes the saw blade stronger, more corrosion resistant and better equipped against temperature changes. All saw blades are replaceable and the replacing itself is simple. 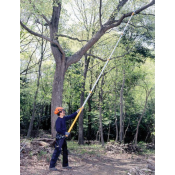 Product descriptionThe Hayauchi brings those difficult to reach branches within your reach and is th.. Product descriptionThe Forester has all characteristics of a professional pole saw, and is still lig.. Product descriptionA real heavy duty tool specially for professionals. The Hayate consists of a heav..
Technical specificationsAuthentic Premium Japanese SteelBlade length: 420 mmTeeth: 6.5 teeth per 30 ..
Technical specificationsHigh-alloy steelBlade length: 420 mmTeeth: 6.5 teeth per 30 mmDimensions: 60..
Technical specificationsDimensions: 80 x 75 x 2.6 mmWeight: 60 g..
Technical specificationsAuthentic Premium Japanese SteelBlade length: 380 mmTeeth: 7.5 teeth per 30 .. 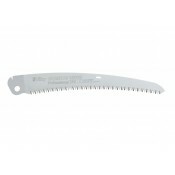 Product descriptionThe Gomtaro pruning saw is an essential piece of your equipment and a user’s firs..